Tot 2 Tot is a seasonal consignment sale. 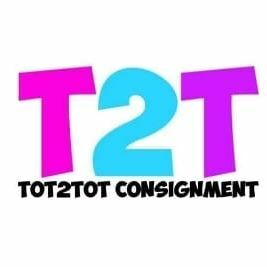 Whether you are looking to purchase high-quality, affordable children's items or are looking to make a little extra cash and clean out your closets, Tot2Tot is the place to go!! We offer children's items for sizes newborn through teen size 16. We also offer toys, books, videos, and gear for babies, toddlers and kids. And not to leave out the mommies-to-be, we offer maternity clothes and support items! Our Spring Sale 2019 we have added a Men's section. Each sale's offerings differ depending on our participating sellers so you never know what treasures you might find! Always watch our facebook page for updates on our sales!! There will be a $1 entry fee per person added to the end of your transaction. This is to help offset the cost of rental with the church and the software that we use.